In the beginning of July David was in a town in the mountain areas of a country in Southeast Asia. Since this was the rain season the festival was held indoor. 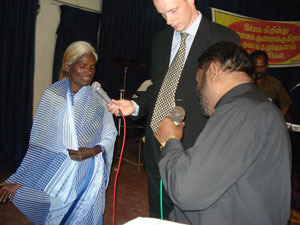 - I and our local coordinator Priyantha, preached for five nights, David say. The crowd was growing every night. The last night the hall was full. 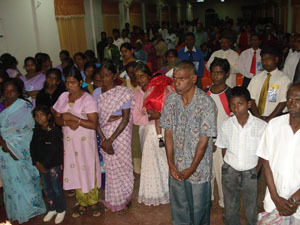 The people responded gladly to the call of Jesus, when they heard the message and saw the miracles taking place. One night one woman was set free from evil spirits that had been tormenting her in many different ways. One symptom had been that she was so stiff in her face that she could hardly talk. - The local pastors and believers were very excited and are now riding on this wave that the power of the gospel has created in their region. We also held a seminar for local leaders and we believe God for harvest workers to go out into the fields to bring in the harvest, David concludes.